We are a non-profit organization dedicated to spreading the joy of swing dancing. We feature monthly rotating teaching teams with some of Denver's best teachers, and Denver's only weekly FREE hour-long Lindy Hop lesson. You will find us in downtown Denver dancing every Friday night at the historic Turnverein Cultural Center. We invite you to look through our site to discover more about the Swing Club, its instructors, our classes, weekly & special dances, and the benefits from becoming a Turnverein member. on March 1 & 2, 2019. Both shows feature a free swing dance lesson at 6:30 pm and followed by a energy-packed show!!! Don't miss this fun event at the historic Stanley Hotel in beautiful Estes Park. Friday is a seated show starting at 9:00 pm, Saturday's dancing show starts at 9:00 pm. The free East Coast Swing lesson starts at 6:30, and showtime is 9:00 pm both nights. Please checkout the Stanley Hotel's website for full details. Lindy Hop was so named after Charles Lindbergh's flight to Paris in 1927, when the newspaper headline read: "LINDY HOPS THE ATLANTIC". The dance has no "hop" in it. On the contrary, it is smooth and solid, and while there is a constant rhythmic 8-count "pulse" that you feel in your bones, there is no hopping, bopping, or prancing in the dance. Lindy Hop, also known as Jitterbug, is the authentic Afro-Euro-American Swing dance. 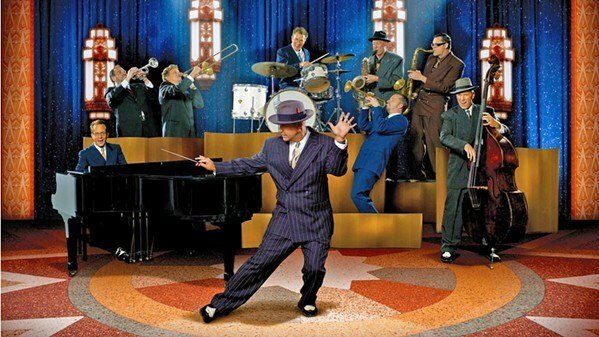 It is an unabashedly joyful dance, with a solid, flowing style that closely reflects its music -- from the late 20's hot Jazz to the early 40's Big Bands. Just as Jazz combines European and African musical origins, Lindy Hop draws on African and European dance traditions. The embracing hold, and the turns from Europe, the breakaway and solid, earthy body posture from Africa. The dance evolved along with the new swing music, based on earlier dances such as the Charleston and the Black Bottom, by black people in Harlem. Lindy Hop is a social dance. Partners are connected smoothly and gently to each other, while relating closely to the music, in feeling, improvisation and phrasing. The core tempo range is 120-180 beats per minute. Films such as Hellzapoppin and Day at the Races, as well as Malcolm X and Swingkids show seemingly reckless airsteps (aerials), often done at very fast musical tempos. Far from being just acrobatic antics, airsteps are in fact smooth, extremely precise, and perfectly in synch with the music. They require a superb degree of expertise and are not danced socially, but only for performance, if only inside a protective ring of spectators, as in the Cats' Corner jams at the Savoy Ballroom. Airsteps are impressive and spectacular, so that's what you see in the movies! Savoy style Lindy Hop, as taught by Frankie Manning and Steven Mitchell, has the lightest, gentlest, and smoothest connection of all the common Swing dances! It is solid, low, relaxed and energetic. Just as Swinging Jazz music feels very different from, say, Rockabilly music, Lindy Hop feels very different from other dances, such as WCS, ECS, Jive, and Rock'N'Roll-Jitterbug, especially in posture, partner connection, and musical connection. Lindy Hop is a Jazz dance. Jazz is dancing music. Swing is Jazz music. What is the difference between Swing Dancing, Lindy Hop, Jitterbug, East Coast and West Coast Swing? Swing dancing is a catch-all phrase that can be used for all of these dances. Lindy Hop is the original swing dance. Jitterbug and East Coast swing are synonymous with each other - both use the same footwork. West Coast Swing is done to more modern music, and dancers move in a narrow space on the floor called a slot. Lindy Hop and West Coast Swing footwork rhythm is similar, Lindy Hop movements aren't restricted to a slot. What are the benefits of joining the Turnverein? Please refer to the Turnverein Cultural Center web site for benefits for the other clubs. Both the Beginner and Intermediate lessons start at 7:00 pm. The Beginner lesson is in the main ballroom, while the Intermediate lesson happens downstairs. From time to time we have additional lessons that will start at 8:00 pm downstairs. There is FREE parking in the Turnverein parking lot, and we have overflow lots. Even if you know where the overflow lots are located, YOU MUST get a permit FIRST for that night. You WILL get towed if you don't have a permit. Do I need to bring a partner for the lesson? No, you do not need a partner, because dancing with different people is essential to your progress to become a better dancer. During the lessons the instructors will call on either the Leads or Follows to rotate. Rotating partners allows you to take notice if your Leading or Following works with other dancers. The Lindy Hop community is very social and during the dances everyone dances with everyone any way. You don't have to rotate, but you will advance your learning curve if you do. What time does the dance start? The dance is scheduled to start at 8:00 pm, and sometimes runs a little bit late because of the Beginner Lindy Hop class. The dance goes until midnight, except on the first and third Fridays of the month when the Groovapalooza dance goes until 1:00 am. If a swing-related event is happening, the dance might start at 9:00 pm. You should check the Events page for links to those events and verify the start times. How much do the dances cost? As a Turnverein member our regular DJ dances are $ FREE each week. If you're a non-member the cost is $ $8.00 . Turnverein members get in FREE on the first Friday of the month. Prices may vary on nights featuring a band or other special events. What kind of shoes/clothes should I wear? Wear whatever is comfortable, that should be your primary concern. You'll find people wearing any number of things ranging from jeans and dress pants, to shorts (in the summer) and skirts. It is highly recommended that the clothes be loose, rather than tight fitting and you should consider bringing additional shirts or tops to change into, as this is a physical activity and you will likely perspire (sweat!). No one likes dancing with a sweat-soaked partner. For shoes, we ask you wear shoes that won't scuff our hardwood floors. In the winter, we ask that you clean the soles so salt and gravel don't get tracked onto the floor, and always make sure the soles are dry. Women tend to wear flats rather than heels. Experienced dancers will put suede or duct tape on the bottom of sneakers (tennis shoes) since those shoes are nicely cushioned, and the suede or duct tape allows your feet to glide across the floor with control. Is it okay to decline someone a dance if I feel uncomfortable dancing with them? Dancers, Follows AND Leads, should NEVER feel obligated to dance with anyone that makes them feel uncomfortable. You should decline graciously, and the proper etiquette is to NOT dance with someone else on the song you just declined. Who do I speak to if I have DJ requests? Please understand that the DJ could be working to create a flow to the music for the night, and isn't obligated to play your request. Additionally, they might not have the song you requested. Who do I ask if I want to become a member of the board? What if I want to be more involved with what goes on with the Swing Club? Who do I speak to if I want to teach for the Colorado Swing Dance Club? Who do I speak to if I would like to have a specific teacher teach? 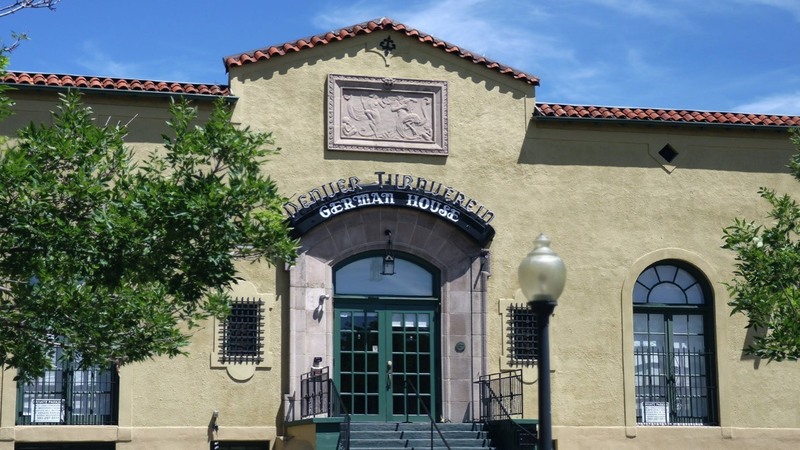 The Turnverein Cultural Center - Historic Downtown Denver building with gorgeous 5,000 sq. ft ballroom. Home of the Colorado Swing Dance Club. The Mercury Cafe - The place to Lindy Hop every Thursday and Sunday. Eight Count Magic - Without a doubt Lindy Hop is THE MOST FUN you can have standing up! CM Dance - Get info for the next dance workshop coming to town. Swingin’ Denver - Swingin’ Denver helping grow the swing dance community! SwingPlanIt - A comprehensive guide to swing dance festivals on the planet!